Fresh off a series of acquisitions in the city and Henrico County, a local development firm is casting its investment net further south into Chesterfield County. 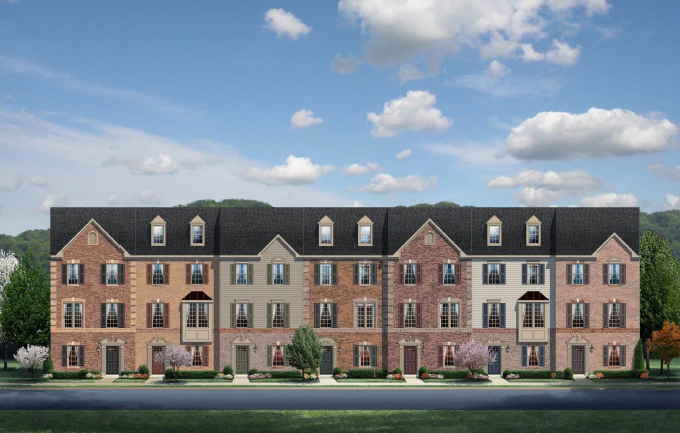 Thalhimer Realty Partners, the investment and development arm of Cushman & Wakefield | Thalhimer, is set to develop Winterfield Commons – a 5-acre mixed-use project at 14030 Winterfield Road in the county’s Midlothian section. 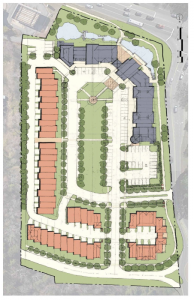 A site plan review application for the development was submitted March 20 to the county’s planning department, which is reviewing it. 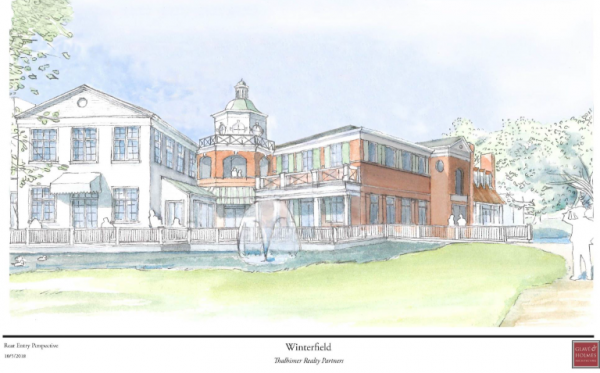 Plans call for Winterfield Commons to incorporate 50 townhomes and 15 apartments that will sit atop 23,000 square feet of ground-level retail. 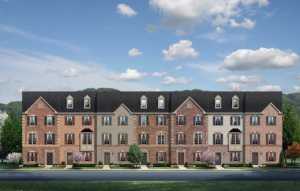 The development will be accessible via Winterfield Road and Winterfield Lane, which will be realigned to connect with Midlothian Turnpike. The two-story mixed-use building would back up to Midlothian Turnpike and wrap around a parking lot with green space, with the storefront tenants facing the townhomes and parking lot. The project would rise on nine contiguous parcels at the northeast corner of Midlothian Turnpike and Winterfield Road. TRP has not yet purchased the land, which most recently was assessed by the county for nearly $600,000. The Board of Supervisors approved rezoning the site in December 2018 from R-7 residential to a mix of zoning that would accommodate both townhome and commercial development. The entire site would be razed of its existing single-family structures, some that date to the 1940s, to make way for Winterfield Commons. 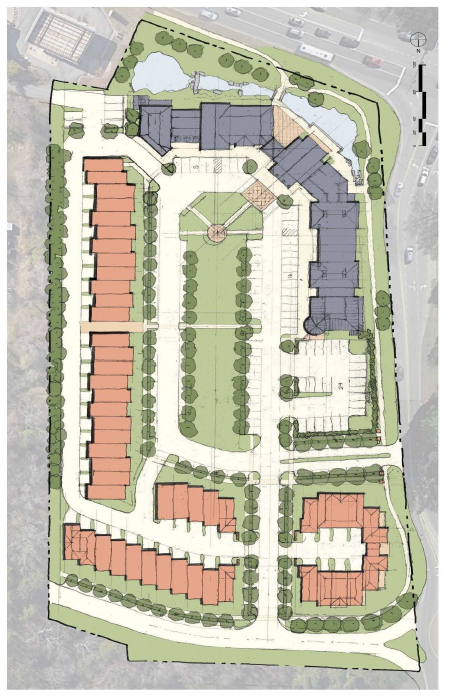 Plans call for 50 townhomes to be built as part of the Commons. TRP Principal Drew Wiltshire said in an email Tuesday the firm would disclose more details about the project next month, but would not comment further. Winterfield Commons is not affiliated with Winterfield Crossing – a 25-acre mixed-use development underway next door that eventually will house 100,000 square feet of retail and restaurant space, a mix of 238 market-rate units and up to 250 age-restricted apartments, and 20,000 square feet of office space. Winterfield Commons would add to TRP’s buying spree in the past six months. The group purchased The Towers on Franklin apartment buildings at 104 and 311 W. Franklin St. in Richmond for $23.5 million in February. The sale also includes surface parking lots at 109 and 108 W. Grace St., along with a half-acre lot at 321 W. Grace St. The company also dropped $14.7 million on Southern States’ headquarters at 6606 W. Broad St. in September 2018 in Henrico County, and was tapped by Bon Secours that same month to redevelop the long-vacant Westhampton School at 5800 Patterson Ave. into a mixed-use, $53 million project. The rear entry for Winterfield Commons.